Located off the I-10 and in-between highways in Coachella, Spotlight 29 is a quick stop casino that’s pretty close to the Fantasy Springs. The casino is operated and owned by the Twenty-Nine Palms Band of Mission Indians and used to be called the Trump 29 before he withdrew his name from it. It’s a modest-sized casino with a number of amenities attached to it, including a 2,200 seat arena called the Spotlight Showroom, restaurants, and a conference center. Spotlight 29 has over 80,000 square feet of gambling space that’s mostly covered by slot games and video poker machines. If you’re looking for table games, the casino has around 40 tables with Texas Hold’Em, Pai Gow, Roulette, Mini Baccarat and 3-card poker on tap, among other things. The Blackjack offer isn’t anything particular, though, as the only truly playable game is the 6 deck shoe game. On the plus side, the casino has plenty of $5 minimum tables for most card games. 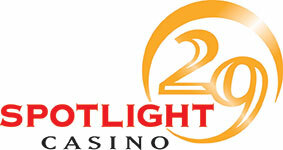 Spotlight 29 has two-three single deck Blackjack tables but they all have the 6:5 payouts, so they’re definitely a no. The minimum at these tables is $5, while the max bet is set at $500 – not that you would want to risk so much on a 6:5 game. If you go before 9/9:30 in the morning you’ll find only these tables open and the minimum will be taken down to $2, so keep this in mind before you visit. The single deck games have the dealer hit on soft 17 and there’s no doubling after splitting, re-splitting aces, or insurance. The penetration is dreadful here and the house edge is ridiculously high – around 1.57%, and that’s with optimal strategy. The only tables really worth hitting are the 6 deck games which Spotlight 29 has around 10 or more. The bet sizes here vary from table to table, but are generally either set at $2 to $50, $5 to $500, and $10 to $500. There’s usually at least one table open with each betting range. At the six deck games the dealer hits on soft 17, you can double on any two cards and double after you split, re-split aces, and there’s no surrender offered. The house edge here is around 0.56% and penetration varies by dealer, although most of them deal to 1.5-2.0 decks. After expanding their casino, Spotlight 29 also introduced Spanish 21 which is offered at fewer tables than their 6 deck games. The 21 is played here with 6 decks and the dealer hits on soft 17 while there’s no re-doubling allowed, which gives the game an approximate house edge of 0.76%. However, if you want to count cards here, you’ll have to take a different approach apart from adjusting your playing strategy. Spotlight 29 used to have a solid double deck game along with their six deck tables which gave it at least some attraction to card counters. But nowadays only the six deck game and the Spanish 21 are worth your time, that is, if you have some experience with 21. The six deck game has a better house edge, which makes it the definite choice here, especially since you are probably already familiar with 6 deck strategies. However, keep in mind that you have to spend some time scouring for the right dealer because the penetration is generally not that very good. Heat wise, you can stay safe as long as you don’t try to show off your skills too much. Spotlight 29 isn’t a bad place to play as long as you can handle working 6 deck tables. The casino is nicely furbished and the staff is nice, but there’s not really anything particularly great, except that you can lower the minimum bet and get better penetration if you come in earlier when there aren’t many people around. But if you’re looking to swap things around a bit, there are other casinos nearby which offer more variety. Fantasy Springs is close to Spotlight 29 and they have double deck, six deck, and Spanish 21 in the main pit, with bet sizes from $5/10.